I needed a cute little centerpiece for the baby shower. 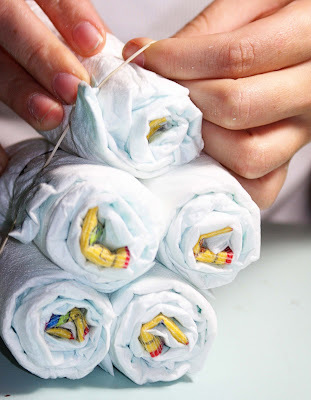 There are beautiful, elaborate diaper cakes but I just wanted to make a little diaper cake. So I started with a 40 pack of size 2 Pampers. Roll up from the Sesame Street end. 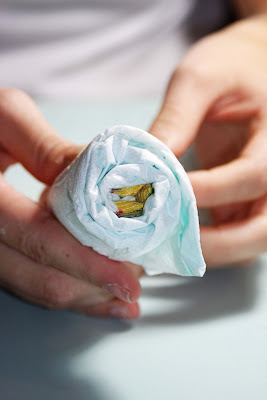 Once the diaper is rolled, secure it with a rubber band. 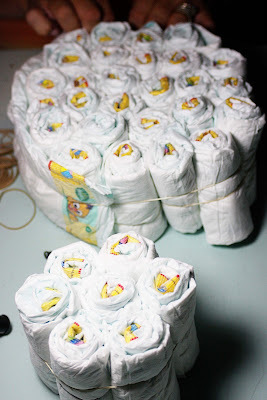 We rolled 32 diapers and bundled in groups of 5, except the top of the cake. The top of the cake is bundled in a group of seven. 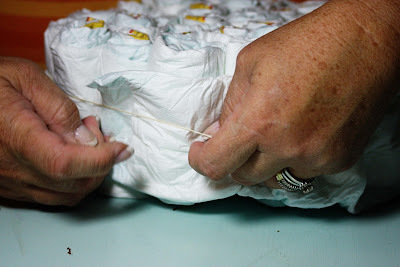 The bottom of the cake, we held the 25 diapers or 5 bundles with one large rubber band. By adjusting the diapers, we were able to make it round. Next we wanted to make the sides a little smoother. 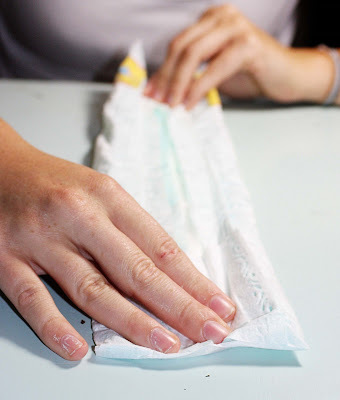 So I worked an open diaper under the rubber band. 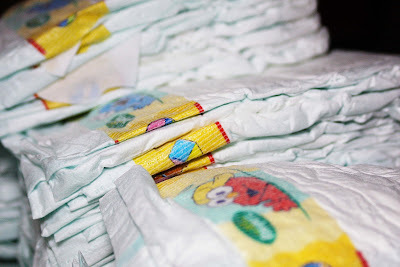 Three diapers covered the bottom with the Sesame Street characters tucked under the bottom of another diaper. 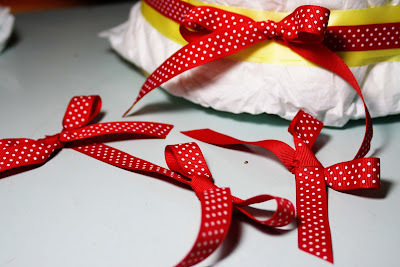 We wrapped ribbon around the "cake" and tied securely. Embellished with a few extra bows. 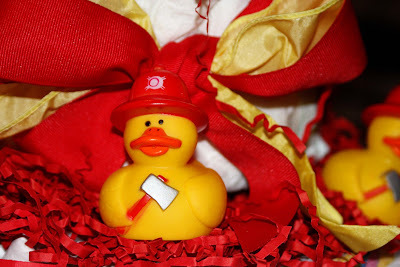 And some cute firemen ducks and shredded paper. 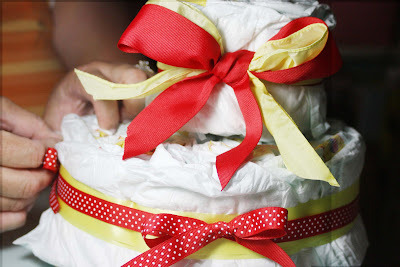 And you have a cute diaper cake centerpiece. $8.47 for the diapers, $.99 for the shredded paper and $5.00 for 5 rubber duckies. A total of $14.46. And the momma can use the diapers. 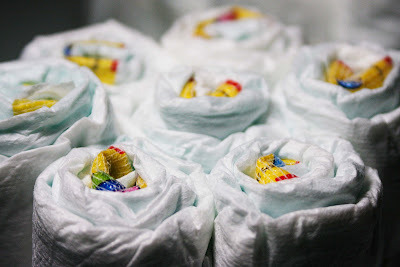 I used size 2 diapers for 14 to 18 lbs babies so they can enjoy the diaper cake for a little while before they need the diapers. That is absolutely adorable Cynthia. You just think of every detail. So cute! I've always wondered how those were made exactly. Thanks for the detailed tutorial. Love, love, loved the tutorial! You are amazing!!! Can't wait for all the pictures! Great job, I'll keep your instructions again, like the pom poms! Love the fun colors you used. 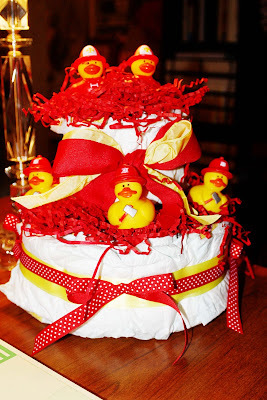 I adore your little diaper cake with the fireman ducks...so cute!